Since 1993, Arite Used Auto Parts has offered a complete line of used auto body parts. Used auto and truck parts, re-manufactured auto parts, aftermarket parts, transmissions, engines, and more. We are committed to quality and customer satisfaction. Arite offers daily delivery services to Connecticut, New York, Massachusetts, Southern New Hampshire, Southern Vermont, as well as nationwide shipping across the United States. You can be sure your parts will arrive on time when you order from us. Whether your ordering local or across the country, we got you. Recycled parts are good for the earth and better for your wallet. They are reusable, ecofriendly products harvested in an efficient, environmentally responsible process from other motor vehicles that provide components for replacement or repair services. You don't necessarily need a new battery for your vehicle! The secret to saving money on batteries is to consider our used stock. 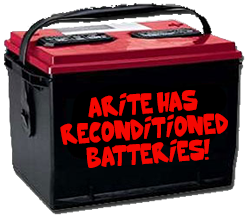 Our reconditioned batteries work like new and will cost you less than a brand-new item. Stop by today and check out our low prices.